Sony Pictures Entertainment Chairman Tom Rothman assured theater owners Monday that his studio is dedicated to appealing to a range of audiences — from global franchises such as "Spider-Man" and "The Girl with the Dragon Tattoo" series to family films, action pics, comedies and even Quentin Tarantino's Leonardo DiCaprio and Brad Pitt film "Once Upon a Time in Hollywood." 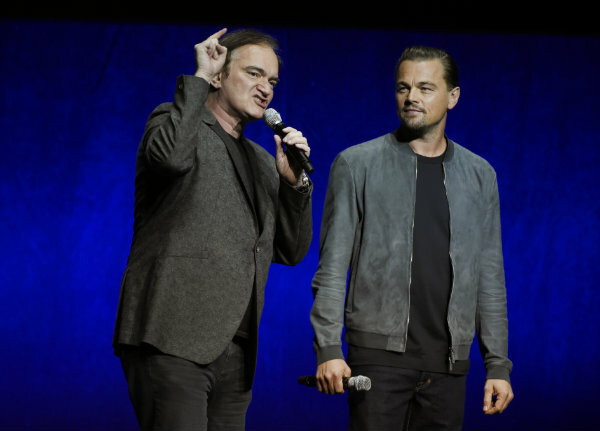 "This is probably the closest to 'Pulp Fiction' that I've done," Tarantino said, of the kind of Los Angeles film he hopes to make. He said Pitt and DiCaprio together will be "the most exciting star dynamic duo since Robert Redford and Paul Newman." The studio also rolled out intense new footage from "Venom," which Tom Hardy said he wanted to do for his son, and "The Girl in the Spider's Web," with "The Crown" star Claire Foy in the role of Lisbeth Salander who, Rothman said, makes "Wonder Woman look like a Powerpuff Girl." "The thing I think makes this special and truly, truly compelling is that you can't describe her," Foy said. Director Fede Alvarez, who was behind the horror hit "Don't Breathe," said that there is an audience demand for "good-quality filmmaking." "I believe in movies that provoke. Movies you cannot ignore. Movies that hit the cultural conversation. I'm confident this movie will hit all fronts," Alvarez said of "The Girl in the Spider's Web." Rothman also said that a "Jumanji" sequel, with Dwayne Johnson, will be coming in December 2019. "Don't rush to give all those screens to 'Star Wars' again," Rothman said. The Johnson-led reboot, "Jumanji: Welcome to the Jungle" became a massive hit in the early part of the year, making over $956 million worldwide. The CinemaCon convention features massive presentations from each of the major studios, in addition to a few of the smaller ones, like Amazon, with sizzle reels and stars to wow the theater owners with what's coming up and why theaters should be excited about the fresh movies on the horizon. Alternating at times between a variety show and a business meeting, Sony's presentation featured everything from Will Ferrell promoting the comedy "Holmes & Watson" by singing "My Heart Will Go On" and talking about winning $50,000 playing roulette earlier in the evening, to actress Gina Rodriguez, in support of the action pic "Miss Bala," stressing the importance of the Latino movie-going audience. "Latinos make up every one in four tickets sold," Rodriguez said. "To give them a project like this feels like such a gift, such a blessing for your audience." According to the Motion Picture Association of America, Latinos made up 18 percent of the population in 2016, but represented 23 percent of frequent moviegoers. Sony showed rough footage from its animated "Spider-Man: Into the Spider-Verse," which features the voice of Shameik Moore as Miles Morales/Spider-Man at hits theaters at Christmastime. "I'm not the only kid who imagined himself being 'Spider-Man,'" said Moore. And Matthew McConaughey was on hand, too, to tease the gritty period piece "White Boy Rick," in which he plays a hustler and a schemer and all-around bad, but well-meaning dad to a teenage boy who ends up becoming an undercover FBI informant. "Wait till you see this performance," McConaughey said of the unknown actor, Richie Merritt, who plays the lead. From studio executives, to the filmmakers behind the projects, all stressed the quality and diversity of the upcoming films. "We're dedicated to the range of audience, including having a staunch, and increasingly rare dedication to originality," Rothman said. "We are not all superheroes all the time. But we are in the global franchise business."